CLEAN, NEAT AND TIDY - This roomy, comfortable, well maintained, 2 Bedroom plus a Den, 2 Bath, Concrete Block Home with Rock Facade & Iron Gate has easy care Ceramic Tile throughout all rooms in this open floor plan. Driveway, walkway and Sun Patio in front all have pavers and landscaping has custom curbing around Beautiful tropical and blooming plants and trees. Back yard is partially fenced with more curbing. 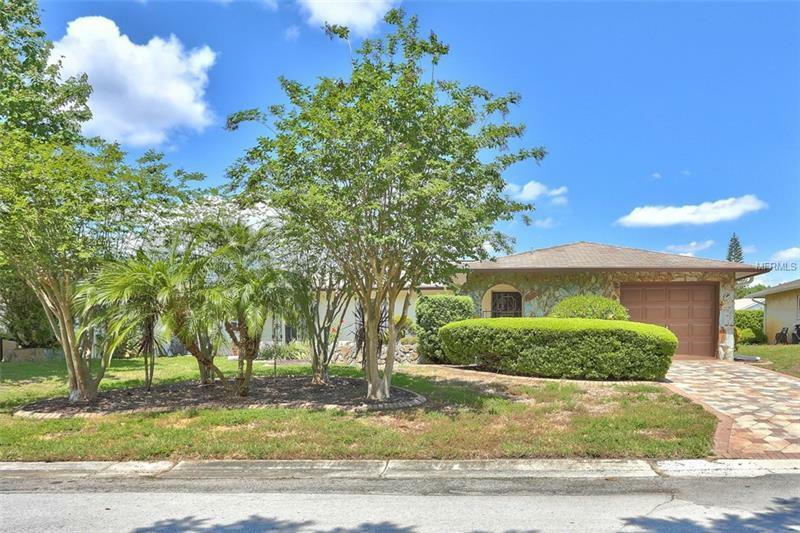 This roomy home has a Florida Room with lots of windows, and a screened porch on the shady North side, Den, big bedrooms with roomy closets, Eat-in Kitchen, nice foyer with convenient big closet & large open Living/Dining room. The over-sized garage is 24x18, has side access door & plenty of room for a car and a workshop. Lake Forest is a small community with friendly neighbors, located in a circle around a small lake with a private park which makes a nice evening walk. Enjoy your open patio with rock wall in the front to greet your neighbors as they pass. Close to shopping restaurants, great schools, hospitals and everything important. Water Heater 2006, Roof 2007, A/C 2012. Furniture may be purchased separate. (Sq Footage does not include 120 sf Florida Room and 190 sf Screened Porch) Hurry to see this little jewel!